Field Notes From My First Rare-Bird Sighting – Animal Lovers Unite! As a yard birder, I’d never felt the urge to jump in my car and drive dozens of miles just to set eyes on an obscure species. But never say never. 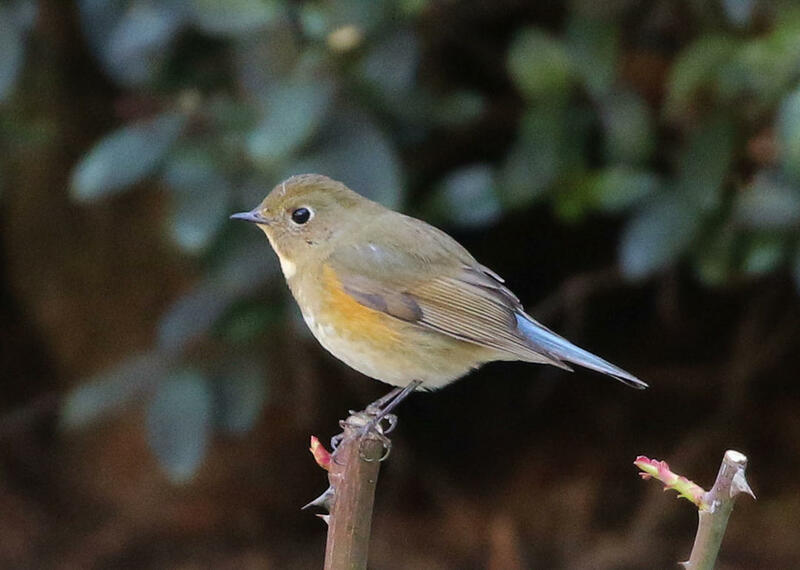 When I first learned on Twitter that a rare Red-flanked Bluetail had been spotted at a library in downtown Los Angeles, my interest was piqued. I already had my feelers out for newsworthy birds, thanks to the massive coverage of the Mandarin Duck in New York last October, and I wanted to experience an epic sighting in my own city. The far-astray bluetail, first spotted on December 21, had settled into the easy-to-access, well-landscaped grounds of the William Andrews Clark Memorial Library at the University of California, Los Angeles. The robin-like species is usually found in Southeast Asia in winter and Siberia during breeding season. And while individuals will sometimes turn up in Europe or Alaska, this was only the third known record in California. Before making the trip, though, I researched logistics. First, I verified the presence and exact whereabouts of the bluetail using eBird checklists submitted by other visitors. (I got the tip through the Cornell Lab of Ornithology’s new Facebook group, The Feeder Flock.) On eBird I was able to study photos of the species and compare them to ones taken at the library. The Los Angeles bluetail must be a female, I reasoned: Unlike males, she was mostly brown with streaks of blue on her tail. I then reached out to Clark librarian and Audubon member Rebecca Marschall, who discovered the bluetail while birding near her office. Given its rarity, she first guessed that it was a funny-looking Hermit Thrush. But after getting a few more glimpses and finally nabbing a photo in January, she confirmed the surprising ID. Marschall told me that the bird had been popping up almost daily, and urge me to come over to have a look. So, at 10 a.m. on January 18th, I joined 60 other birders in the large garden behind the library. We stationed ourselves on a long grassy path lined with leafy trees and a giant berry bush and waited for the Red-flanked Bluetail to appear. I’ll be honest, waiting around in silence in such a tight crowd wasn’t easy. I got distracted more than a few times, either by a flitting Hermit Thrush or an attention-seeking Black Phoebe. But I tried to follow the pros and their cues, knowing they would alert me to any sign of the bluetail. Sure enough, after two tense hours, one person whispered that she’d spied the bird up in a tree. Everyone aimed their binoculars at the branches, and those who were quick enough to find it began describing its location. I didn’t have binoculars, so I used their directions to direct my gaze, finally landing a peek through the thick foliage. As the bird whizzed from tree to tree, the group followed. As the bird whizzed from tree to tree, the group followed. On previous afternoons it had been seen hunting for insects on the ground—but today, the crowd kept driving it up to the canopy, or so a frequent visitor told me. While the other birders lingered by the trees and chatted, I fell back to the center of the lawn. I'd had enough of chasing the bluetail, and I felt badly that we might have kept her from lunch. Thankfully, a few moments later the bluetail flew directly over my head, giving me a clear, bare-eyed view. It zoomed by in a whirl of blue, brown, and white and perched on the branch where it’d originally been spotted. I didn't bother trying to get a photo with my smartphone; the bird seemed skittish, and I wanted to minimize my presence as much as possible. Instead, I remained in the moment and watched the bird for a few more minutes before heading home back to my feeders. Overall, I enjoyed the experience of the day. It expanded my view on feathered life, and allowed me to be part of the local lore. It also made me think about other chances to bird away from home. As a months-old birder, I learned from the veteran crowd at the library, and realize there is more to glean in the field. Next time, though, I’ll try a relaxed venue, like a festival, where my success isn't determined by seeing a single bird. As of February 1, the Red-flanked Bluetail is still being seen at the William Andrews Clark Memorial Library. The grounds are open from 9 a.m. to 5 p.m., Monday to Friday.